Hello everybody, and welcome to HaCoder. Today, I am going to teach you about Browser forensics. In this tutorial, we will explore where and what the forensic investigator can find information about the activities of the suspect in their web browser. It’s important to note that this information will vary by operating system and browser. Here we will look briefly at Internet Explorer and go into a bit more depth on Mozilla’s Firefox. Let’s begin with Microsoft’s Internet Explorer. It is installed on every single Windows system as the default browser (except on newer versions of Window 10 where Edge is default, though IE is still installed), so it is widely used. In many Institutional and Corporate environments, it is the only browser allowed. IE places its records in different places depending upon the version of Windows. Let’s look at its recent versions since 2000 first. 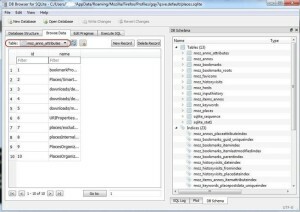 Please note that AppData and Temporary Internet Files are hidden files. With Mozilla Firefox and its many variations (IceWeasel in Kali Linux is one), most of the information is stored in SQLite databases. We can find those databases at different locations based upon the operating system. SQLite is now being used by many browsers, applications, and mobile devices that require a small, lightweight relational database. Due to its lightweight nature, it is becoming increasingly popular among mobile devices and mobile apps. That being the case, it is critical that any competent forensic investigator become familiar with it as it is becoming very popular. 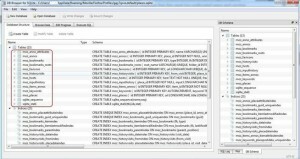 To view or query the data in these SQLite databases, we will need a browser. You can download SQLite browser here. If you are using Kali, the SQLite browser is preinstalled. 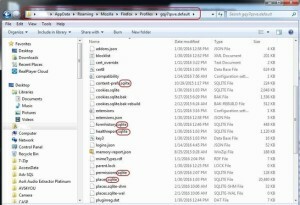 You will see many files ending with “sqlite.” These are the database tables that Mozilla uses to store the information on the user’s browsing activities. 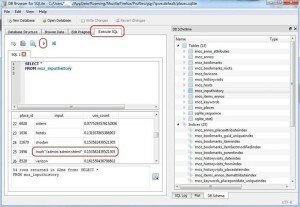 If we click on the “Browse Data” tab, the SQLite browser will display the data in the table we have selected. In the screenshot below, we are looking at “moz_anno_attributes”. Now that we have a basic knowledge of the database structure, let’s use some simple SQL queries to find specific and relevant data to our investigation. 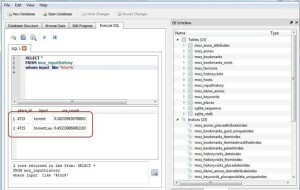 After entering the query, click on the play (>) button to execute the query. As you can see, the suspect was typing some suspicious Google hacks using the keyword “inurl” and looking for admin directories. Hmm… we may be on to something here! This query will provide us all columns (SELECT *) from the input history table (FROM moz_inputhistory) where the typed input is like “tor” (WHERE input like ‘%tor%’). Note the wildcards (%) before and after tor. This indicates that we are looking for anything before tor and anything after tor. This query should provide us with results of any input by the user that has “tor” anywhere in it. As you can see in the screenshot above, we were able to find two occurrences where the suspect/user had input “tor.” This may be enough evidence to prove that the suspect was actually looking for torrent sites, but we may want to dig a bit deeper to actually find the URLs of the sites in his places history (moz_places table). That’s it for now. Be sure to check other cool stuff at Hacoder. Any questions, comments or suggestions are welcomed. Until next time, Its Webster, signing off.